Presenting 650 SBAs, 180 EMQs, 50 x-ray interpretation cases and explanatory answers, Complete Self Assessment for Medical and Surgical Finals, Second Edition allows medical students to test themselves on these challenging areas. 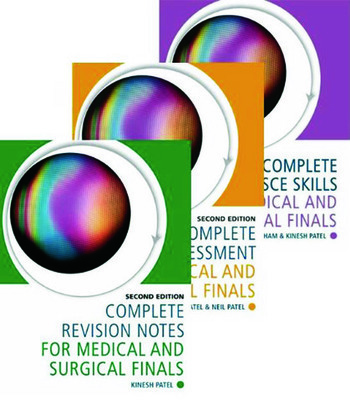 Complete Revision Notes for Medical and Surgical Finals, Second Edition presents information in a stimulating way, which in turn enables easy recall. Structured by medical and surgical specialties, the contents are organised in a weighted fashion to reflect coverage in undergraduate curricula. Complete OSCE Skills for Medical and Surgical Finals covers the entire undergraduate syllabus for clinical finals and provides the essential information needed to manage OSCE stations competently, and will help you to pass your medical and surgical finals.